Fusion is a form of nuclear energy with the potential to create massive amounts of heat by forcing atomic nuclei together. It is essentially the opposite of fission, which involves splitting atoms apart. In the sun, gravity creates the conditions for fusion. Here on earth, the challenge is to create similar conditions by using magnetic fields. One of the most efficient fuels for fusion power is a mix of heavy hydrogen isotopes (deuterium and tritium), which means that water could become a primary fuel source. Fusion also has the potential to become the cleanest form of energy production—with lower overall emissions than hydro, solar, or wind power—and produce waste that has short-lived radioactivity. Around the world, fusion research is still in the developmental stage, mainly because of the very high temperatures it requires. Even after a sustained fusion reaction is achieved, a further challenge will be to extract useful amounts of energy from it. There are a number of promising concepts. The most advanced is “magnetic confinement,” which suspends hot hydrogen fuel in the form of a plasma, or ionized gas, within a strong magnetic field. The primary apparatus for achieving this confinement is a toroidal (doughnut-shaped) structure of powerful magnets, called a tokamak. Another concept, “inertial confinement,” involves directing lasers or particle beams onto a fuel pellet, creating enormous pressure. The University of Saskatchewan’s Plasma Physics Laboratory, which operates a small tokamak, called STOR-M. 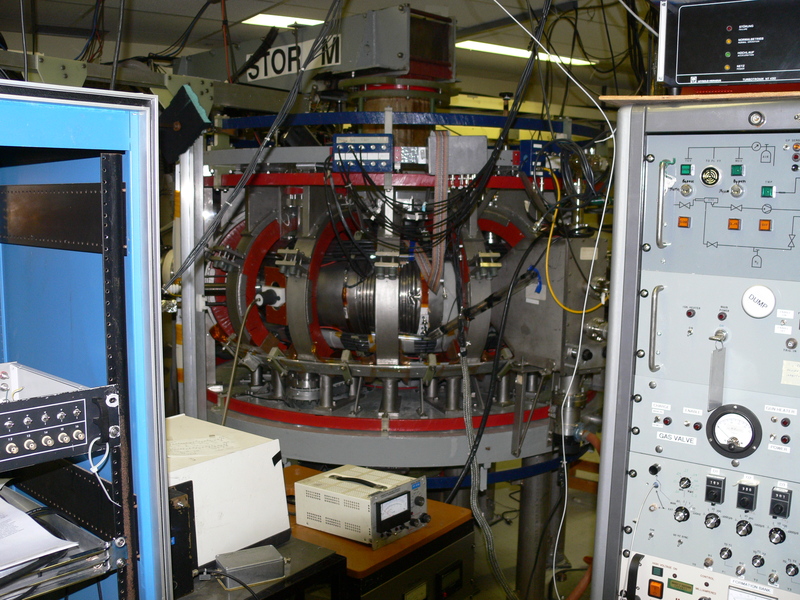 The STOR-M tokamak, operated at the University of Saskatchewan. Source: University of Saskatchewan. British Columbia’s General Fusion, which is leading an alternative technology called Magnetized Target Fusion. This technology aims to lower the ultimate cost of fusion power; it starts with a toroidal plasma similar to the one created in magnetic confinement, and then uses rapid compression to increase the temperature and speed of the fusion reaction. 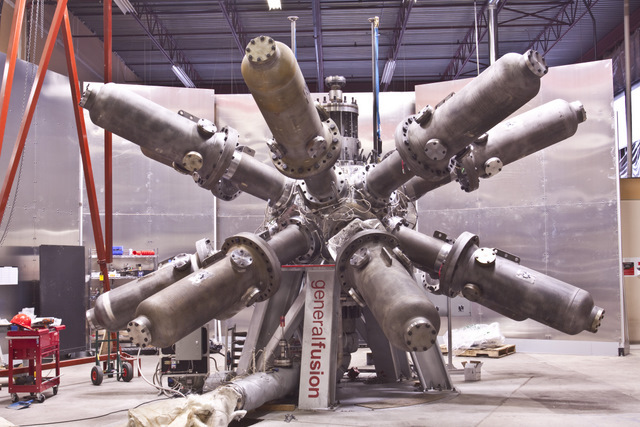 General Fusion’s prototype compression system. Source: General Fusion. Researchers at the University of Alberta, who have focused on the principles of inertial confinement as part of a broader study of plasma properties and applications. Plasma physics research at the Institut National de la Recherche Scientifique (INRS) in Quebec, which has focused on magnetic confinement and fusion-reactor technology, including investigating the physical principles of fusion power plants. The Tritium Facility at Canadian Nuclear Laboratories, which has been involved in several tritium-related research and development activities, such as the development of tritium-breeder materials and the design of fusion-fuel cleanup systems. Fusion research and development draws on expertise from many disciplines, including physics, materials, electronics, and simulation—and, in turn, contributes valuable knowledge to these fields. The need for diverse expertise encourages widespread international collaboration and cooperation in fusion research. Canada contributes to these efforts, in addition to its domestic work on magnetic confinement and Magnetized Target Fusion. Canada also contributes to international efforts through its experience and knowledge in the area of fusion fuels. Canada’s CANDU nuclear reactors operate by using deuterium, while tritium is a natural byproduct of fission. By working with these isotopes, Canada has gained expertise in their production and handling.